Since I can't read German, I can only presume that they have written good things about our Musical trail in Concerto. Feature is not available online. 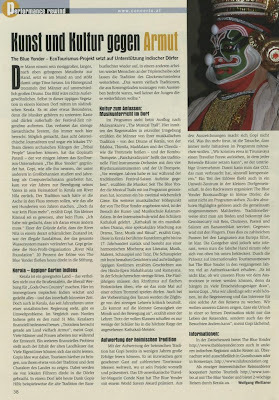 Click on the image to read in German. This is the 4 th article on TBY in the media in less than two weeks. The Week's 'Healthy things to do in 2009', a mention on TBY and Foundation in the Sunday Indian Express, a detailed reference to TBY in Travel Trends Today (T3). None of this available online. So shall try to upload one by one.